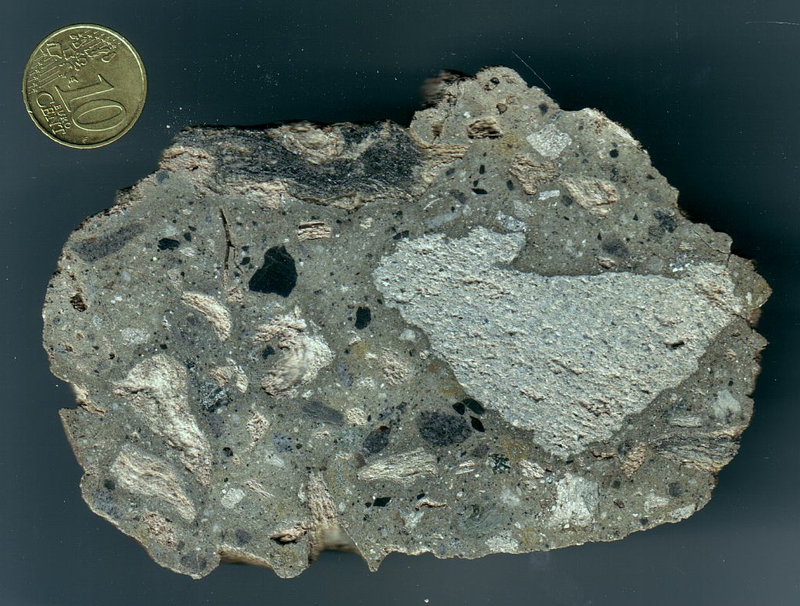 A polymictic breccia (suevite) as an impact rock – impactite. From the Rubielos de la Cérida impact basin, Spain. “Impact rocks” and “impactites”, which can be considered synonymous, are informal, somewhat woolly terms. They basically describe rocks that have been produced in a meteorite impact process like impact melt rocks, suevites and various impact breccias. 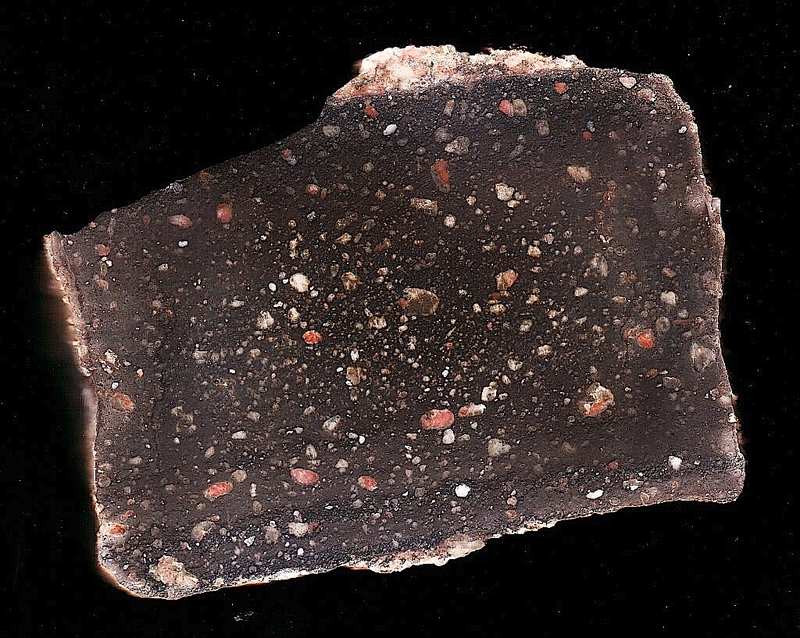 In the broader sense and frequently used on the commercial level (shops, ebay etc), impactites comprise all items related with meteorite impacts such as impact glasses, tektites, shatter cones, pseudotachylites, and even samples from the K/T boundary and rocks that may possibly have formed in an impact (e.g., the Sudbury anthraxolite). 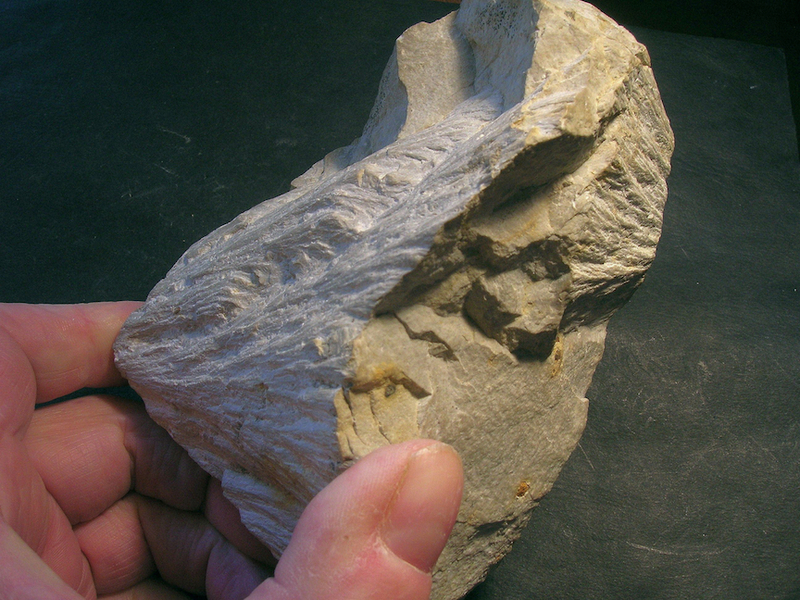 Here it should be pointed out that the term “shatter cone” does not at all describe a specific rock but stands for a special type of fracture markings resulting from shock load. Like plumose, lancet or conchoidal fracture markings, shatter cones may develop in all kinds of rocks. On our websites we have already early pointed to the largely inconsistent and geologically often dubious definitions presented by this IUGS impact study group. Meanwhile, the members of the IUGS impact subgroup have become a little bit more insightful having eliminated many of the mistakes (see for example die IUGS web version 01.02.07 [D. Stöffler & R.A.F. Grieve] to be clicked HERE). However, even the in part new classifications are furthermore all but cogent and frequently lack all intrinsic logics. This will be shown here by a few examples. Basically, the impactites are subdivided into three principal groups: shocked rocks – impact melt rocks – impact breccias. Most woolly and geologically least significant is the newly introduced term of the “shocked rocks” which are defined as non-brecciated rocks displaying unequivocal shock effects. A subgroup classification is made referring to the so-called “progressive shock metamorphism”, but a rock originating from whole-rock melting is explicitly excluded! — When does a rock show unequivocal shock effects? According to current understanding surely if there are planar deformation features (PDFs) and/or diaplectic glass to be observed which require already high shock pressures of 5 – 10 GPa. But what about rocks that perhaps experienced similar shock pressures having resulted in, e.g., characteristic kink bands in mica, feldspar or quartz, or planar fractures (PFs) in quartz? These deformations are not unequivocal because they may originate also from extreme tectonic pressure. According to the IUGS definition: Are these shocked rocks no “shocked rocks” although they possibly underwent the same shock pressures? What are they then? No impactites? — The classification into subgroups is made with regard to stages of “progressive shock metamorphism”. How so? According to the IUGS Table 2.11.3 the progressive shock metamorphism shows various stages of shock load which despite a numbering, however, are more or less merging with regard to the observed shock features. Exactly as to be expected. But to further cluster the group of “shocked rocks” in such a way misses the point of every geologic reality. All this is ill-conceived and is also demonstrated by the fact that the progressive shock metamorphism is defined for quartz-feldspathic rocks only and, hence, can only be applied to this type of rocks. — Out of all reason with regard to the “shocked rocks” definition is the exclusion of rocks that experienced the highest degree of progressive shock metamorphism (whole-rock melting). Understand that if you can! How to draw the line between a “shocked rock” and a “whole-rock” melt rock when I hold a sample in the hand? How many percentage melt is needed to define a rock as from whole-rock melting and no longer as to be a “shocked rock”? 90%, 99%, 99.9 %? — What about a pre-impact breccia (e.g., a tectonic breccia) being strongly shocked in an impact event? Is it a shocked rock? Rather not, because it is a breccia, right? The second IUGS group of impactites, the “impact melt rocks”, is even more finely subdivided, practically without any geological significance. There are three subgroups which are subclassified each. Again the subdivision remains woolly when the impact melt rocks are separated into clast-rich, clast-poor and clast-free rocks. What does rich and poor mean? Is it related to proportionate volume or to the quantity of individual clasts? Why a classification when I’m unable to select the box for putting the sample in? Even more confusing is the new classification of impact breccias subdivided into three subgroups. The text mentions two: lithic breccias and suevites as subordinate to the broader term of the polymictic breccias (Table 2 in Stöffler & Grieve). At the same level of the impactite tree, however on a neighboring branch, the monomictic breccias are posted implying the polymictic breccias to be allochthonous breccias separated from the monomictic breccias to be parautochthonous breccias. Lithic impact breccias differ from suevites by the lack of impact melt particles corresponding with the earlier designation. However: Are they impactites at all then? No shock effects are mentioned in connection with lithic breccias and suevites. 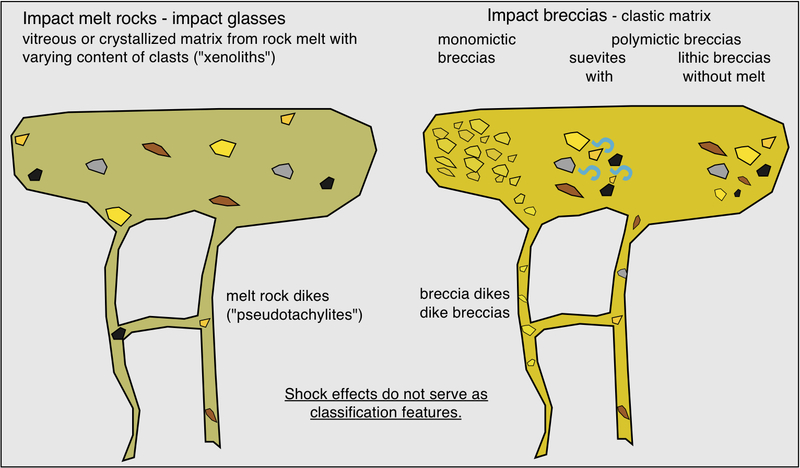 And this is the very problem: If the lithic and suevitic breccias display shock effects they are, referring to the above definition, no “shocked rocks” because they are breccias. How can we recognize whether a breccia from the field is a lithic impact breccia or an ordinary polymictic breccia? If there are shock effects, it is nevertheless not a shocked rock because the breccia is a breccia. You all right? And how to assess that monomictic breccias are ranking among parautochthonous impact rocks only? And what after all are monomictic breccias that are shocked? Of course no shocked rocks …. see above …. And what about the large rock complexes of monomictic breccias that were excavated and ejected out of an impact structure to considerable distances like the well-known large monolithologic, heavily brecciated Malmian limestone allochthonous blocks surrounding the Ries impact structure? On to questionable classification considering dike-like impactites. After all, the term “pseudotachylite” has been eliminated, but the differentiation into dikes and veins (and vein networks) remains absolutely meaningsless. What is a dike, what is a vein? How can I make a difference? Are there no dike networks? Moreover, according to Table 2 impact dikes and impact veins are exclusively limited to the crater basement, which is far from geologic reality. Admittedly, the richness of newly formed impactites and rocks modified by impact does not make things simple all the more a nomenclature is to a great extent a matter of geological scale far too little underlined in the IUGS compilation. Summarizing, this IUGS compilation must be labeled half-baked at best. We are seeing a major shortcoming of the IUGS efforts in that the classification and nomenclature is far too much dominated by mineralogy and petrology and that geology and practical verification largely fall by the wayside. This dominance of mineralogy and petrology in impact research, originally and some 40 – 50 years ago very beneficial with regard to the opposition of geologists, must today be seen rather critical. An IUGS classification and nomenclature should also integrate geologically more experienced impact researcher and let them have their say. As a consequence und with regard to our impactites presented here we do not recommend the Stöffler & Grieve compilation and, logically, do not adopt it either. Fig. 1. Simple classification of impactites guided rather by geologic requirements than by a mineralogically and petrologically dominated nomenclature of the IUGS. Shock effects are not considered because they don’t provide any reasonable criteria for a distinction. It is emphasized that a clear distinction is first of all a matter of scale and – concomitantly – transitions of all kinds may exist. Also see the text. Here, we are leaving the earlier nomenclature largely unchanged and we think that a simple classification closer to geology meets the requirement. With regard to “normal” geological classification we roughly subdivide into sedimentary and crystalline impactites. The sedimentary impactites largely comprise the clastic rocks of impact breccias (monomictic and polymictic breccias, breccia generations (breccias-within-breccias), megabreccias). The crystalline impactites have originated from chilling of impact-produced rock melt, and the vitreous or crystallized matrix may contain any mineral fragments and rock clasts – like a magmatic or volcanic rock that may inclose xenoliths of different lithology. Hence, we simply maintain the earlier classification of impact melt rocks and impact breccias and subdivide the breccias into monomictic breccias and the polymictic lithic breccias (without melt particles) and the polymictic suevitic breccias (with melt particles) (Fig. 1). Without any problem the same subdivision may apply to dike-like impactites to term them impact melt rock dikes and impact breccia dikes (Fig. 1) . And even the term “pseudotachylites” may be used further on as synonymous of melt rock dikes provided the name is not related genetically. It is worth mentioning that shock-metamorphic features (shock effects) are not considered for our classification. A clear distinction between a shocked rock and a non-shocked rock is impossible, and even for a single mineral grain we cannot decide whether, e.g., cleavage (planar fractures, PFs) has originated from shock or whether it is tectonically produced. Moreover it is absurd to establish such a distinction for a whole rock sample considering that even in the smallest space from mineral grain to mineral grain the shock load evidence may range from non-shocked to heavily shocked. There is one more reason speaking against a constrictive classification with subgroups and subtypes. It is the geological aspect (far from the mineralogist’s microscopic resolution) seeing every imaginable transitions among the “pure” rock types. Monomictic breccias may merge into polymictic breccias, suevites with high amounts of melt may merge into impact melt rocks with high amounts of clastic components, breccia bodies may thin out into net breccias and breccia dikes, and so on. To make things yet easier to visitors and readers of the website we have not only separated into submenus of impact melt rocks and impact breccias but also created a special submenu for the “classical” suevites (suevitic breccias) especially here pointing to the problems of a clear assignment. And again we emphasize that in the submenu of the shatter cones we are not dealing with a special rock type. Fig. 2. Carbonate melt rock, Jaulín, Azuara (Spain) impact structure. 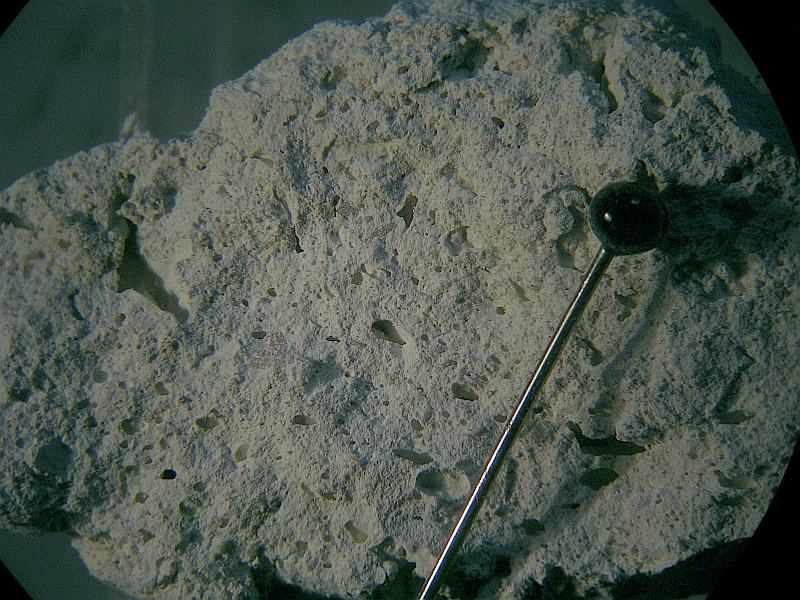 Impact melt rocks from carbonate melts have only more recently attracted some interest by impact researchers. Fg. 3. Impact melt rock (granophyre); Vredefort impact structure (South Africa). <12 cm>. Originally, before Vredefort became identified a big impact structure, this rock was considered a quite normal endogenetic magmatic rock. Fig. 4. Suevite, Wanapitei (Canada) impact structure. Originally, suevite was the name of a seemingly unique volcanic rock from the Ries crater in Germany named for the German Swabia province. When in the sixties/seventies the Ries crater proved to be a Tertiary large impact structure the suevite “metamorphosed” to a seemingly unique shocked impact breccia. But soon it became evident that a suevite is a quite common impactite in impact structures all over the world. Fig. 5. Polymictic impact breccia, Rubielos de la Cérida (Spain) impact basin. 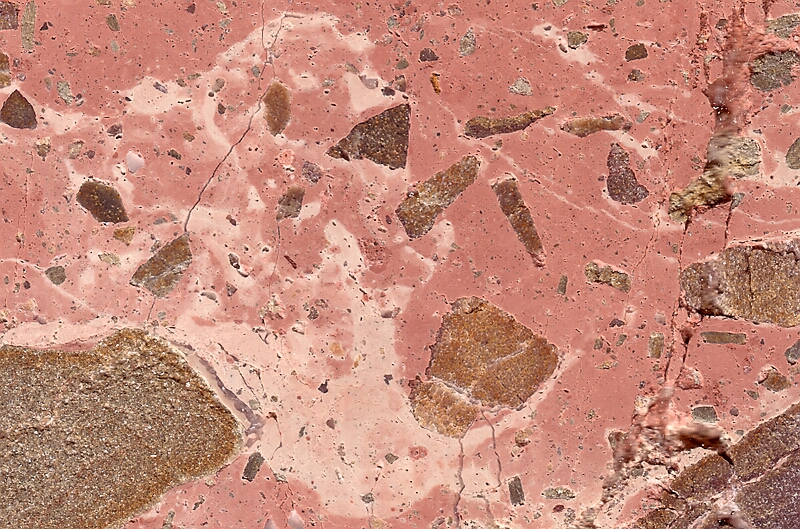 From an “artistic” point of view this impact breccia may be issued with the attribute “most attractive” among all impactites. Sample by courtesy of P. Bockstaller. Fig. 6. 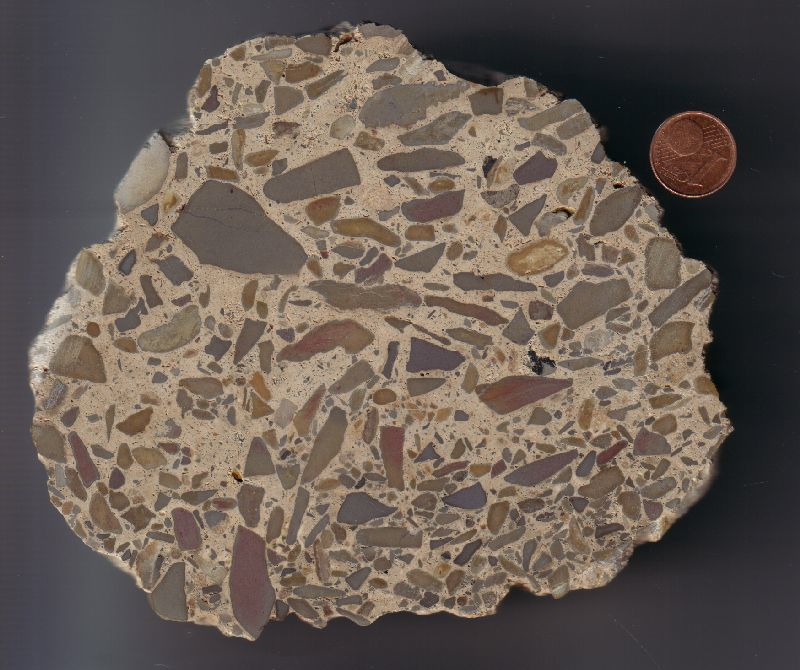 Shatter cones, Kentland (Indiana, USA) impact structure. In general shatter cones are orientated with their apex pointing more or less to the origin of the shock wave. In this case the counter orientation of the two cones is an exception to the rule which however can be explained physically. Sample by courtesy of Richard Dreiser.